ViewSonic's dual OS tablet, the ViewPad 10pro, is now available for pre-order via Amazon.com. That's the good news. The bad news is the tablet that runs both Windows 7 and Android 2.3 OS is in danger of being outdated before it loses that "new car smell". Here is why. The ViewPad 10pro caters to businesses and "prosumers" who want to switch between Windows 7 and Android. Sounds great, but the ViewPad 10pro runs Android 2.3, not tablet-optimized 3.0 (Honeycomb) and not Windows 8. The ViewPad is expected to debut sometime at the end of August. Even with the older version of the Android OS and Windows 7 this appears to be a good tablet, at least on paper (PCWorld has not reviewed the ViewPad 10pro yet). However, despite Windows 7 being a great OS, the upcoming Windows 8 OS is being billed as perfect for devices such as tablets. As buzz grows about Windows 8 (Microsoft plans to show off Windows 8's capabilities next month at the BUILD conference) the question remains will consumers balk at buying a Windows 7 tablet running an older version of the Android OS with Windows 8 buzz thick in the air? If you can't wait until Windows 8 makes it onto a tablet and like the flexibility of having both Android and Windows 7 on a slate, the ViewPad 10pro does offers some nice features, as this video shows. Android runs as a virtualized layer on Windows here so you can switch between the operating systems by tapping on an icon, rather than having to reboot. Who knows; you may be able to upgrade to Windows 8 when it comes out. The ViewPad 10pro also uses the new battery-life-friendly 1.5GHz Intel Atom processor Z670, giving it a little bit of an edge over older Windows 7 tablets. It features 1080p full HD video playback on the 10.1-inch screen, a decent 2GB of memory, HDMI port, and micro SD card slot for up to 32GB of additional storage space. Priced at $699 for the Windows 7 Pro version with 32GB drive or $599 for the Home Premium version with 16GB drive, the ViewPad 10pro is a little on the expensive side, but it is tailored for business users. 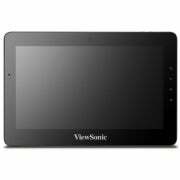 Available for pre-order now at Amazon, ViewSonic's press release says the ViewPad 10pro will be widely available in late August with "limited numbers currently available"-from where is unclear, as searching for online merchants from the ViewPad's product page brings up no results. You only have to wait a couple of more weeks if you want this dual OS tablet, though.